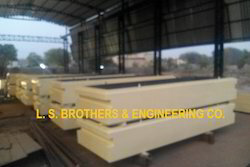 AAC Mould is used to AAC Plant, AAC Block Machine, foam block machine, autoclave aerated concrete block machine. Slurry could be held in the combining of mould and side plate. After curing it would be solidified into block. The side plate could load the block which shall be cut by cutting machine and feed into autoclave to be hardened together with the trolley. This AAC mould has 4 side plates and a bottom plate, all of the side plates can be opened. When the block is stiff enough to be cut, the side plates of the mould are opened by hand or machine and the mould is moved on cutting line also, after AAC MOULD cutting, the block with mould is moved down from cutting line.